Clockwise: Dr. Noah Rosenblatt, Dr. John Calamari, Dr. Kristin Schneider, Dr. Roberta Henderson, former chair, Department of Physical Therapy, and Captain Christopher Reddin. 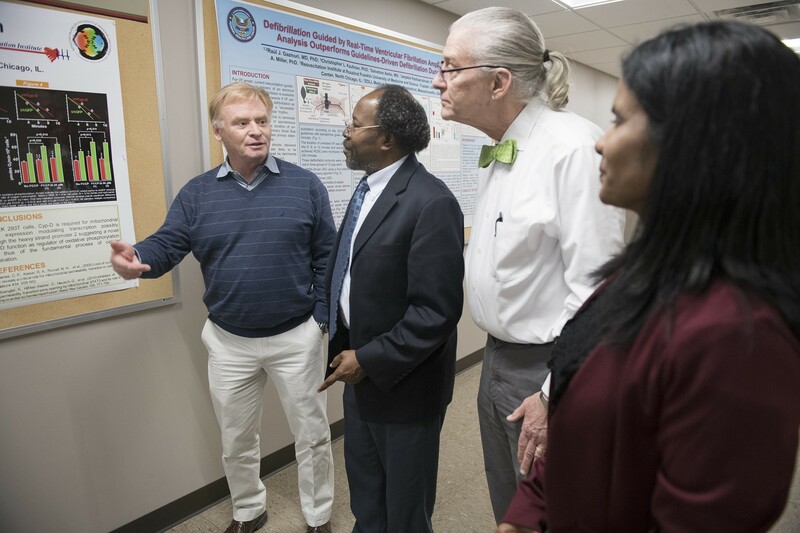 RFU researchers and Captain James A. Lovell Federal Health Care Center (FHCC) clinicians are working together in interdisciplinary, cross-institutional teams to improve the health and lives of veterans and active duty military. Numerous studies are now underway, including in the areas of falls prevention, gut health and respiration. Ongoing conversations led by Ronald Kaplan, PhD, RFU executive vice president for research, and Walid Khayr, MD, Chicago Medical School professor and FHCC infectious disease section chief, are aimed at developing collaborative research projects with an emphasis on discovery of new approaches to the treatment of post-traumatic stress disorder (PTSD), a mental health issue that will affect between 11 and 30 percent of veterans at some point in their lives, according to the Department of Veterans Affairs. "Our goal is the translation of our conversations into projects that are very patient-centered," Dr. Khayr said. "We're meeting in a very structured way so we can reach that outcome." 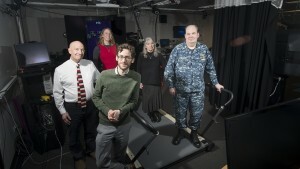 "Targeting Balance Confidence as a Strategy to Increase Integration and Improve Outcomes in Users of Lower-Limb Prostheses," a three-year, $500,000 grant from the Department of Defense, aims to demonstrate that an intervention combining physical therapy (PT) exercise to improve function with cognitive behavioral therapy (CBT) to address fears and thoughts associated with low confidence and activity restriction can significantly improve balance confidence and in turn promote community participation by lower-limb prosthetic wearers. The expected benefits of the study, including a reduction of injurious falls, could potentially impact 1,600 service members who as of June 2015 have endured major limb amputations, in addition to the more than 2,500 older veterans who each year receive major lower-limb amputation. Studies have shown that low levels of balance confidence threaten to hinder social integration, a harm to well-being. Study participants wear prosthetic monitors to track activity, play active video games to improve balance and gait, and take part in exposure therapy. "This is the first study I've ever run where our primary outcomes are not biomechanical measures," Dr. Rosenblatt said. "We're really trying to change behavior here by changing thoughts that might interfere with physical skills or improving the physical skills directly. That's where our psychology and physical therapy faculty are invaluable." Behavioral psychology plays a crucial role in the prevention of falls, which are the leading cause of disability and trauma-related death in persons over 65 years of age. "I think sometimes in my field we feel the need to justify the importance of behavior and psychological principles," Dr. Schneider said. "But we don't have to convince our PI, because he's seen the need in his work in other studies." Captain Reddin, a psychiatric nurse practitioner, works with study participants at FHCC to manage mental health issues and medication. 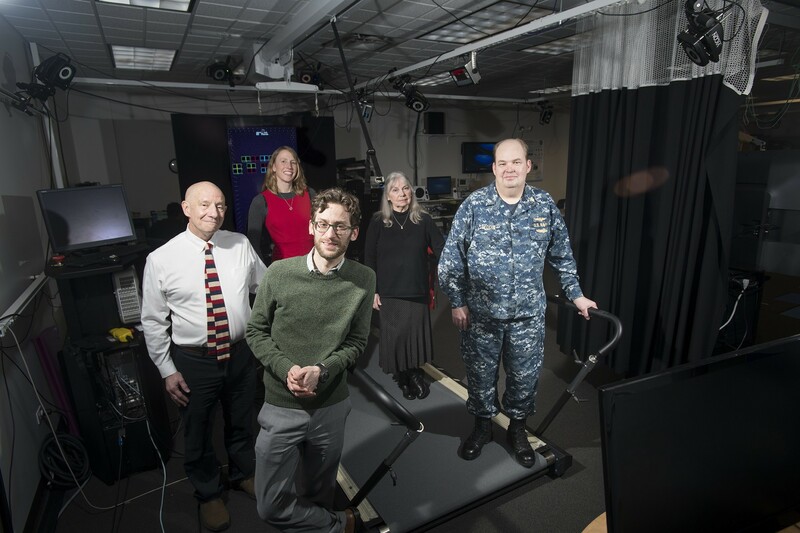 "We're trying to improve balance confidence and prevent falls in veterans who have traumatic injuries, but this project is really the beginning of falls science," he said. "It's really about retraining the mind, attacking the anxiety and symptoms that lead to falls, which costs billions of dollars in direct and indirect costs every year." The primary goal is to identify novel mechanisms that contribute to gastrointestinal (GI) disorders in patients with Gulf War Veterans' Illnesses (GWVI). Work by the group and others suggests that the IL-17 family of cytokines, small proteins important in cell signaling, may be critical in regulating gastrointestinal distress observed in GWVI patients. Under the two-year, $300,000 grant, investigators hope to determine if the cytokines represent viable therapeutic targets. GI distress can be triggered by severe stress and digestive tract infections — both risk factors faced by deployed military personnel. In addition, functional GI disorders have been identified by the National Academy of Medicine, among several multi-symptom illnesses present in veterans, as related to service during the Gulf War. "The goal is to improve therapies for our veterans," said Dr. Reynolds, who is heading a team that includes experts in next-generation gene sequencing, statistical computation, neuropharmacology and a clinician who has seen a dramatic increase in irritable bowel syndrome (IBS) among his patients. Research has shown stress to be a causal factor in IBS. 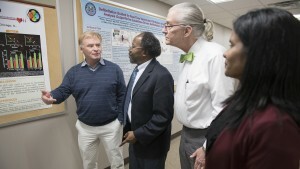 "There's a direct line between the brain and gut 'brain'," said Dr. Reynolds, who cites gut/brain communication and the composition of a person's microbiome — bacteria and microbes that live in the body — as additional stressors that can induce cytokines to act on nerves in the gut and exacerbate symptoms of irritable bowel disease. 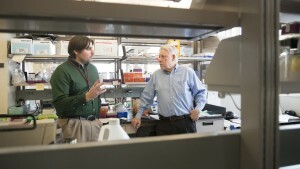 "When I met Dr. Reynolds three years ago, he was working on mouse models of inflammatory bowel disease — Crohn's and colitis — which in terms of incidence in both combat veterans and non-combat veterans and even in young kids joining the service is really high," Dr. Feller said. "He's isolated some cytokines produced by the immune system in mice that could contribute either to susceptibility or protection from IBD [inflammatory bowel disease]. There's some evidence that may lead to identifying a certain cytokine. Then comes the translation and maybe better therapeutics for the condition. Maybe we can treat it more specifically, with fewer side effects." Dr. Reynolds has worked closely with Dr. Feller in knowledge integration. "There has to be give and take to put together a good grant application," Dr. Reynolds said. "I didn't train as a physician. Dr. Feller didn't train as a researcher. I need to share detailed immunology in a digestible way. He needs to share what he's seeing in his patient population and his thoughts about what's going on." "IBS is a health issue across the globe," Dr. Feller said. "What Dr. Reynolds is doing has a direct application to many of the patients we see here at FHCC." 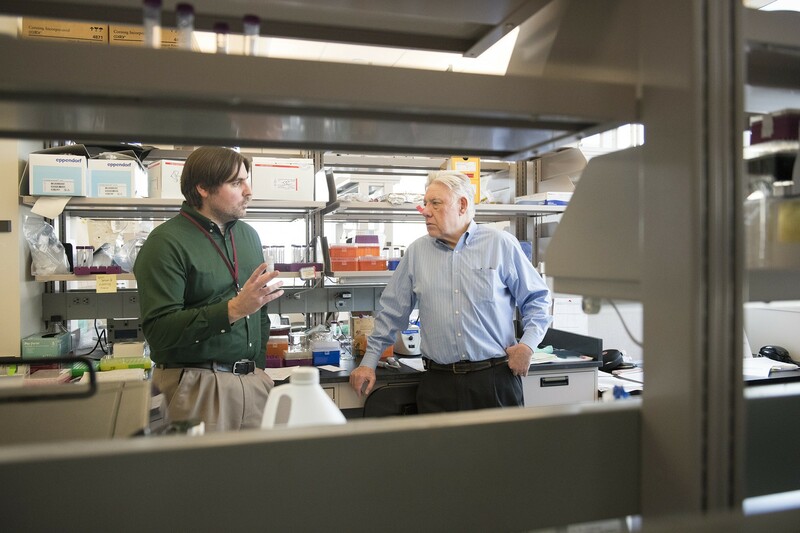 A $650,000, four-year, VA Merit Review grant could determine whether the effects of cyclophilin-D (Cyp-D) — a protein inside mitochondria — can be manipulated pharmacologically to enable organs to perform more efficiently with less oxygen. Researchers at the Resuscitation Institute discovered that Cyp-D regulates the expression of mitochondrial genes and thereby influences oxidative phosphorylation, the process cells use in the presence of oxygen to transfer energy from nutrients into molecules of ATP, the "energy currency" of life. Understanding the mechanisms by which mitochondria, the powerhouse of cells, regulate oxygen utilization could lead to important advances in health and longevity, given that impaired mitochondrial function is increasingly associated with diseases related to aging, including cancer, neurodegenerative and vascular disorders, and heart failure. It could also help the military enhance physical performance and adaptation to altitude. Careful reduction of Cyp-D levels might permit organs to save energy while increasing their resistance to various illnesses and improve outcomes in acute conditions in which oxygen availability is reduced, including hemorrhagic shock and cardiac arrest. The grant resulted from a serendipitous observation made during a project aimed at improving survival from cardiac arrest. Dr. Radhakrishnan, Dr. Gazmuri's research partner for 14 years, was using anti-viral vectors in isolated cardiac cells to inhibit Cyp-D — an effect reported to make cells more resistant to stressors. While Cyp-D inhibition reduced oxidative phosphorylation, the process in which ATP is formed, the cells died. "When I told Dr. Gazmuri, 'The cells are dead,' he was intrigued and asked me to review all other functions of cyclophilins," Dr. Radhakrishnan recalled. "We came up with a novel hypothesis: Cyp-D might be involved in the regulation of mitochondrial gene expression, which codes for proteins responsible for oxidative phosphorylation. We went on to confirm our hypothesis and published the findings in the FASEB Journal. It was a radical departure from our original plan." Dr. Gazmuri and his team continued to study the role of Cyp-D under pilot grant funding through the Alliance for Health Sciences between RFU and DePaul University. They tested mice born without Cyp-D in which the defect is not fatal and, as expected, oxygen consumption was reduced. They were amazed that the mice were still able to achieve higher and longer levels of exercise and use nutrients more efficiently — proving their hypothesis true.